If you are in process of buying a new graphics card then you might want to compare different graphics cards or GPUs in the same price range, so that you can get the one with the best performance and features. 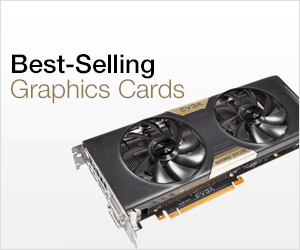 It is easier to compare graphics cards in the same family of the same manufacturer, i.e. Nvidia GeForce 10 series cards or GeForce 700 series. For example it is easier to compare GTX 1050 and GTX 1060 graphics card but it may be difficult to compare Nvidia GeForce GTX 1050 to GTX 960 or to AMD Radeon RX 460. Also comparing graphics cards can be time consuming and takes effort because you have to go their official websites, compare their specs against each other and also have to search for their benchmarks on the internet. But there are some good websites that can help you to compare graphics cards easily and can save much of your time. These websites can compare graphics cards or GPUs from both Nvidia and AMD based on their specifications and benchmarks in gaming or other tests. So here I am going to list down the best websites to compare graphics cards which can help you make easy decision when buying a graphics card for your PC. Here are the best GPU comparison or graphics card comparison websites on the internet. These websites are free to use and provides you a good idea about how powerful one graphics card is compared to another. Personally this is my favorite website for graphics card comparison. 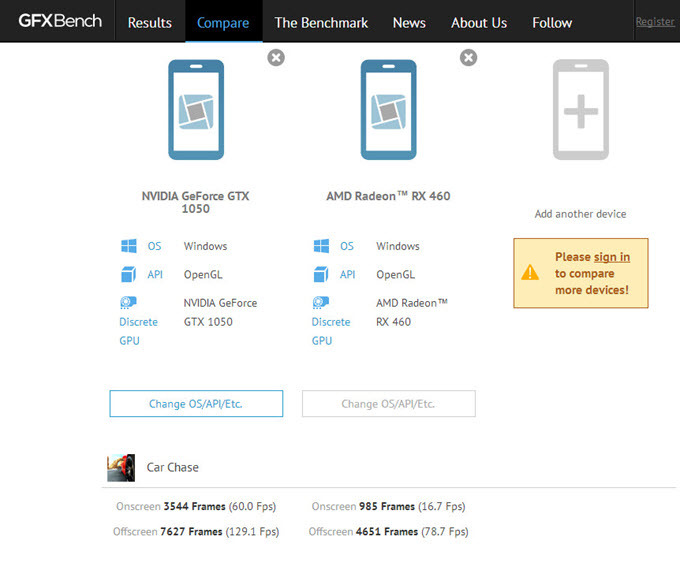 HWBench.com is a very good PC hardware comparison website, and on this site you can compare both graphics cards and CPUs. On the top right side you will see Compare VGAs section where there are two input boxes. Type and select the name of the GPU you want to compare with another and then click on compare button. After hitting the compare button you will be presented with the detailed comparison between both the graphics cards that based on gaming performance index (based on relative performance), specifications, raw performance comparison and game benchmarks. By looking at the comparison you can get a good about the two cards and you can also find out that which one is better than the other. You can compare two Nvidia card or can compare an Nvidia graphics card to an AMD one. On this site you can also have a look at the synthetic benchmark performance of all the graphics cards by going through the VGA benchmarks chart. Highly Recommended GPU comparison website. 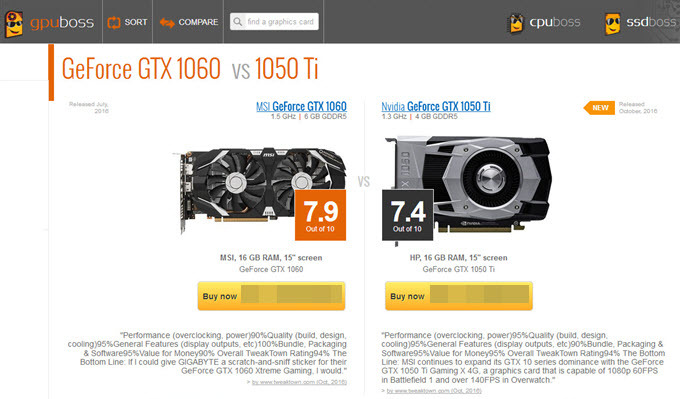 GPUBoss is a very popular graphics card comparison website for comparing two GPUs from Nvidia and AMD. 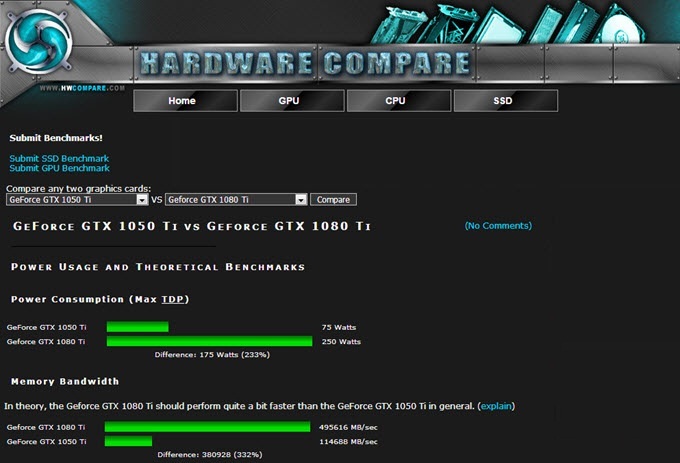 This website lets you compare graphics cards based on the benchmarks and their specifications. The accuracy of the results for benchmarks from GPUBoss is a bit of question mark and it is not good as HWBench. However, it can give you a fair bit of idea about the graphics cards that you are comparing. This is a website from the famous PassMark benchmarking software. 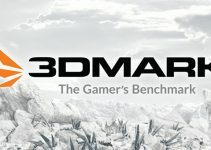 This site only shows the PassMark – G3D synthetic benchmarking scores for different graphics cards from Nvidia and AMD. The various benchmarking charts that you can find on this website are High End Video Card Chart, High to Mid Range Video Card Chart, Low to Mid Range Video Card Chart, Low End Video Card Chart, Best Value Video Card Chart, Common Video Card Chart and GPU Compute Video Card Chart. 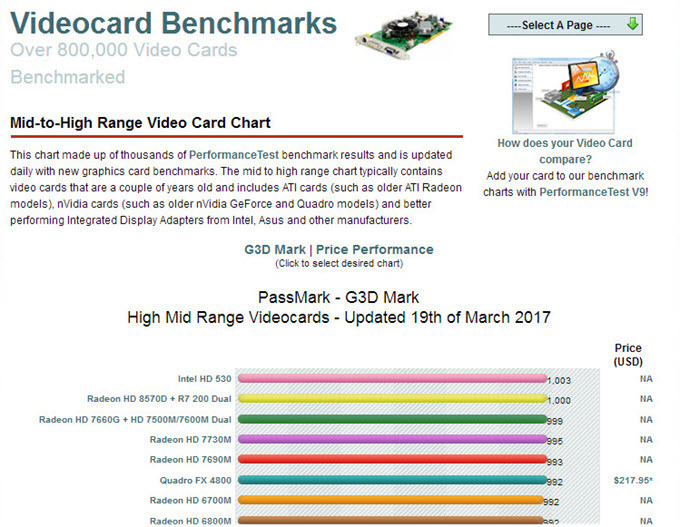 The site is updated almost daily and contains over 8000000 Video Cards benchmarking scores which is huge. HW Compare is a popular hardware comparison website which can be used to compare graphics cards, CPUs and Solid State Drives (SSDs). The website is easy to use and you just have to select the two graphics cards from the selection box and hit the compare button. After that you will get the comparison based on the benchmarks and specifications. Similarly you can also compare CPUs and SSDs using this website. 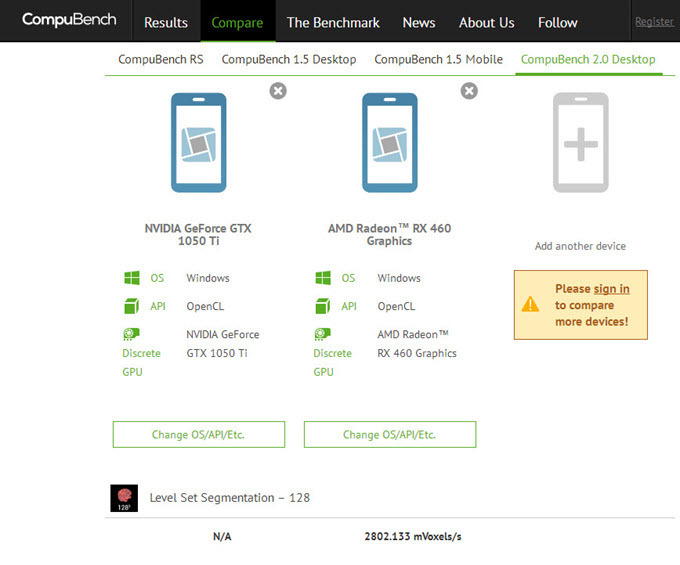 CompuBench is another very good site for graphics card comparison. Here you can compare two or more Nvidia and AMD graphics cards on the basis of their compute performance. This site only provides benchmarks for compute performance in different graphics tests and not the real world gaming performance benchmarks. For real world gaming performance you can visit GFXBench.com which is its sister website. 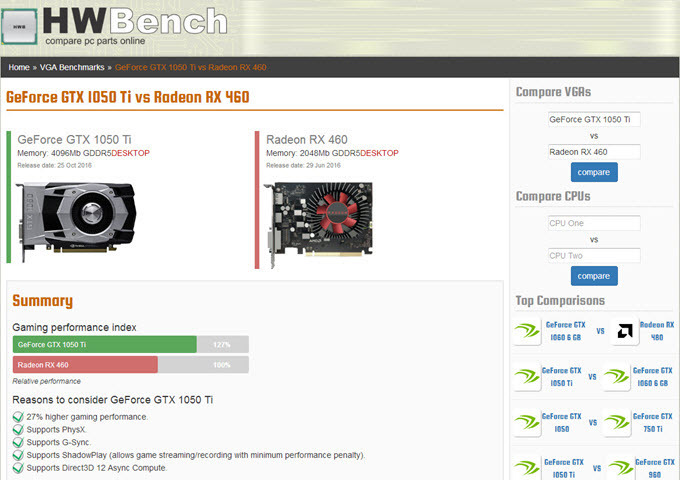 GFXBench is a very popular site or tool to compare graphics cards. On this site you can compare two or more Nvidia and AMD graphics card in real world gaming performance and other synthetic benchmarking tests. You can also compare the results for different graphics APIs that include DirectX and Open GL and for different Operating Systems that include Windows, Linux and Mac OS. Both CompuBench and GFXBench are products of Kishonti Ltd. which is a leading specialist in 3D graphics and compute performance benchmarking. NotebookCheck.net is a popular sited dedicated to laptops / notebooks and netbooks. The site offers reviews, news, benchmarks and technical articles on laptops. On this site you can compare laptop graphics cards from both Nvidia and AMD. 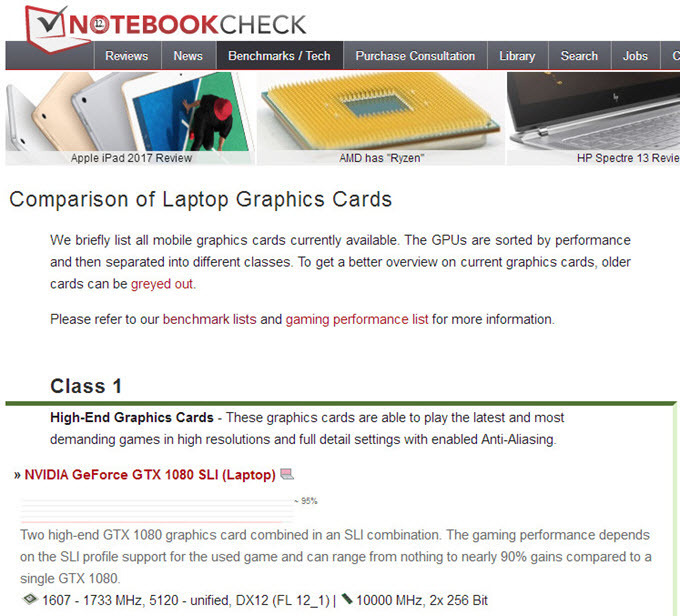 Also you can view and compare the benchmarks of laptop graphics cards or mobile graphics cards. Other than laptop graphics cards, you can also compare laptop processors and view benchmarks of laptop CPUs, hard disks, SSDs etc. The site lists benchmarks and performance of laptop graphics cards for both synthetic benchmarking softwares and in real world gaming. This site can prove very useful for someone who wants to buy a gaming laptop or a regular laptop for work. The site is very active and updated regularly with latest laptop graphics cards and their benchmark scores in games and benchmarking softwares. 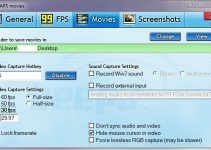 VideoCardz.com is a website that is dedicated to graphics cards or video cards. The site contains reviews, news, and forum on graphics cards. It also has a section for GPU comparison that has comparison of all the GPUs from Nvidia and AMD at one place. The comparison of GPUs are based on all technical factors that include die size, transistors, cores, TMUs, ROPs, core clock, memory clock and size, FP32 performance and more. 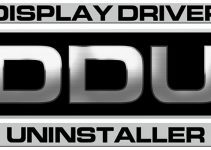 The site also has a download section where you can download drivers for your Nvidia or AMD graphics card. Other special sections of this site include GPU Roadmaps, Memory Bandwidth Charts and pricing comparison of Geforce and Radeon graphics cards. 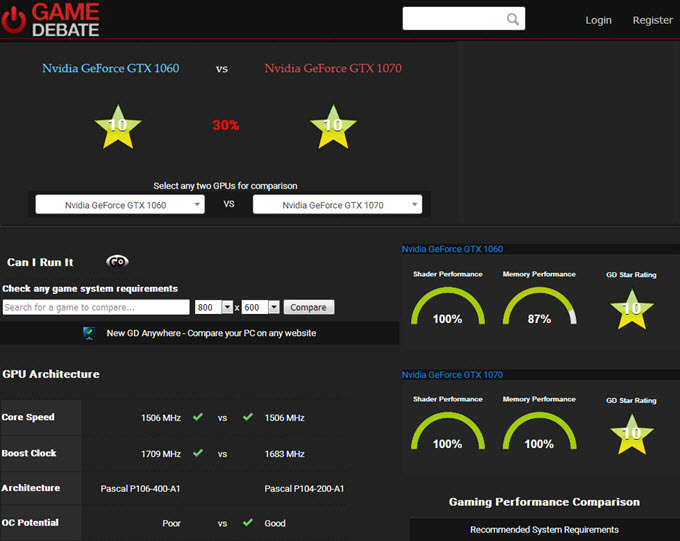 This is a GPU comparison tool from the popular gaming website Game Debate. This tool is also very easy to use and you just have to select two graphics card for comparison from the selection box and then you will be presented with graphics card comparison based on only the specifications of the graphics cards. The accuracy of the comparison is not up to the mark as the comparison is not made on the basis on real world gaming benchmarks and synthetic benchmarks but it can provide you a fair about the specifications of two graphics card that you want to compare. Important Note: All the graphics card comparison websites may not provide accurate results and they just gives a rough idea about the specifications of the two graphics cards. If you want to compare performance of two graphics cards then you should see their real world gaming benchmarks or you can ask an expert about it. If you are still having doubts on selecting the right graphics card or want to clear your doubt on which graphics card is better for you then you can ask me your query by leaving a comment below.